The holy, glorious, all-laudable Apostle Onesimus of the Seventy, is commemorated by the Church on February 15 and along with the Seventy on January 4. 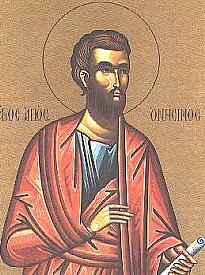 In his youth, St. Onesimus was a servant of Philemon, a Christian of distinguished lineage who lived in the city of Colossae, Phrygia. Fearing punishment for an offense against his master, Onesimus fled to Rome, but he was imprisoned for being a runaway slave. In prison he came across the Apostle Paul and was enlightened by him, and was baptized. St. Paul was personally acquainted with Philemon, and wrote him a letter filled with love, asking him to forgive the runaway slave and to accept him like a brother. He sent Onesimus with this letter. After St. Philemon received the letter, he not only forgave Onesimus, but also sent him back to Apostle Paul in Rome. Afterwards, Philemon was consecrated bishop of the city of Gaza. After the martyrdom of the Apostle Paul, St. Onesimus served the apostles until their end, and he was made a bishop. After the death of the holy apostles he preached the Gospel in many lands and cities of Spain, Carpetania, Colossae, and Patras. In his old age, Onesimus occupied the bishop's throne at Ephesus, after the Apostle Timothy. Onesimus was the Bishop of Byzantium from the year 54 to 68. When they took St. Ignatius the God-Bearer to Rome for execution, Bishop Onesimus came to meet with him with other Christians, as St Ignatius mentions in his Epistle to the Ephesians. In the year 109, St. Onesimus was arrested and brought to trial before the Eparch Tertillus, during the reign of the Emperor Trajan. He held the saint in prison for eighteen days, and then sent him to prison in the city of Puteoli. After a while, the eparch sent for St Onesimus and had him stoned and beheaded for still maintaining his faith in Christ. A certain illustrious woman took the body of the martyr and placed it in a silver coffin. Illumined by Paul, the all-radiant sun, whose rays enlighten the world. Therefore we honor you, glorious Onesimus. This page was last edited on October 24, 2012, at 17:26.